According to first media reports, the U.S. interceptor hit the USA 193 satellite. 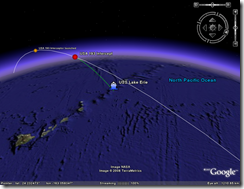 An SM-3 interceptor was launched at 10:26 EST (21 February 2008 03:26 UTC) from a USS Lake Erie Aegis-class cruiser deployed in the Pacific Ocean near Hawaii (at about 23°35.42N 163°06.38W). The intercept was reported to take place three minutes later. The picture on the left shows the position of the satellite at these times and an approximate trajectory of the interceptor(click for a larger view). Note that the accuracy of the data on time of intercept is not very high, so these are useful only for illustration. The orbit is based on the elements posted by independent observers. According to these data, the intercept took place at the altitude of about 250 km. (DoD says the altitude was 247 km.) 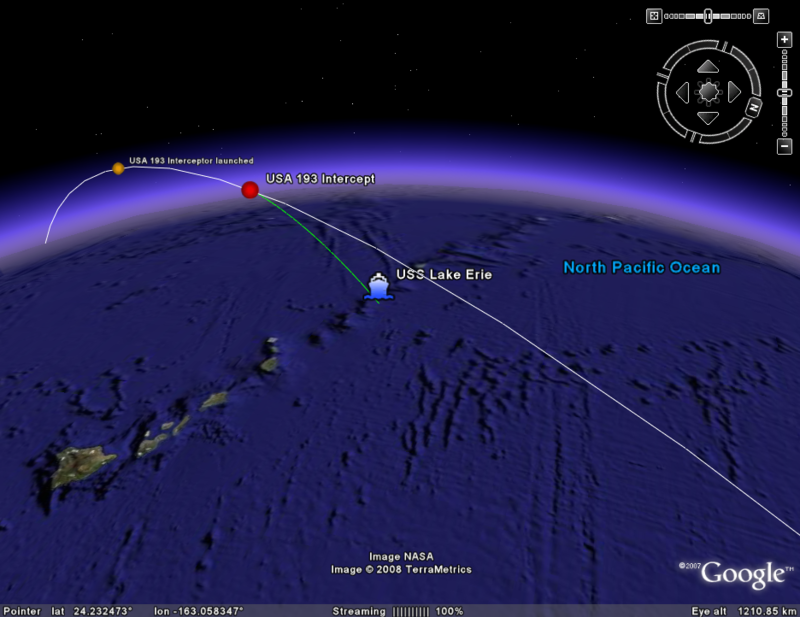 Here is the Google Earth kmz file with the last revolution of the USA 193 satellite. It is not clear if the intercept was successful in its declared goal - destroying the hydrazine fuel tank. The satellite apparently broke up - some debris were observed in Canada, but is not clear what happened to the tank. In fact, it is likely that that the tank would not have survived the reentry anyway, so the intercept was not really necessary. The picture of the right shows the ground track of the USA 193 in the 24 hours following the intercept. If anything comes down, it will come down somewhere along this path. UPDATE 02/21/08: DoD posted a video of the intercept that shows interceptor launch and the result of the intercept (on the left). The explosion appears to be large enough to destroy the fuel tank, but I would reiterate that we don't know if it did. Why state it was not necessary. Was it necessary for China to shoot down one of its satellites? I don't recall so much ballyhoo when they shot one of their satellites down. Even if it was not a "necessity", it clearly demonstrates the SM-3s capability. IMO all this hyoe about ASAT capability is old hat. The ability to knock down satellites has been around for decades. If, and we still don’t know, the United States was able to modify a Standard 3 system to successfully strike a low orbiting satellite it was a tremendous technical achievement. If this modification work, which began only in December, was successful and the missile actually struck the satellite’s fuel tank as speculated, this was even a greater technical achievement. Whether this mission was necessary from a safety position, from a purely political position or from a military position is up for speculation. 1. Congratulations to the US- Navy for this impressive achievement. 2. This intercept shows that trends predicted by Gen. Baluyevsky respect to US ABM systems were right. His predictions were very accurate, so … the trend is here. Gen James Cartwright said in his post launch briefing that some ABM system technology was used in SM-3 interceptor. It was a massive operation which included many strategic defense command and control systems as described by the media and Gen Cartwright. Many experts like Pavel believes, this interception was not necessary purely for safety reasons. I think the US army might test something new! Pavel and Frank, did you watch that Pentagon briefing? What did he exactly mention about the new technology used in old SM-3 system? Actually, the Standard SM-3 ABM system is new and not yet introduced into the fleet. This project came out of the US Navy’s “Wide Area Defense System” project of the early ‘90’s. Back in December, 300 or so military and civilian contractors began the modification work necessary for this mission. The missile itself, the kinetic kill vehicle (KKV), and the launch system had to be modified. Also the Sea-Based X-Band radar system deployed off Alaska had software modifications. I think it’s a misconception to think the Pentagon somehow mobilized massive command and control assets or that this was somehow a huge national undertaking involving far flung assets of the US Government. I think US Strategic Command activated the existing ABM C&C system and certain test resources were made available to the mission planners who executed the “shoot down”. Thanks Frank. Well, why do you think it was necessary to intercept the satellite? We know many outdated and uncontrolled satellites/spacecrafts fell on earth before but nothing serious happened. Even a heavy body like Columbia debris fell on earth but no serious damage done. I think the US NAVY is not still sure about the complete success of the operation. Another 48 hours will be needed to assess the result of the operation as mentioned by Gen Cartwright. I think the stated goal of removing a threat to population centers by intercepting the satellite containing such a large quantity of hydrazine can’t be simply dismissed. However, no matter what is officially said by the US Government, no one wanted the satellite’s technology compromised by it falling on foreign soil. I’m certain the decision to “take the shot” was based on both those concerns. Where was expected to fall? Where it was to fall is a good question. 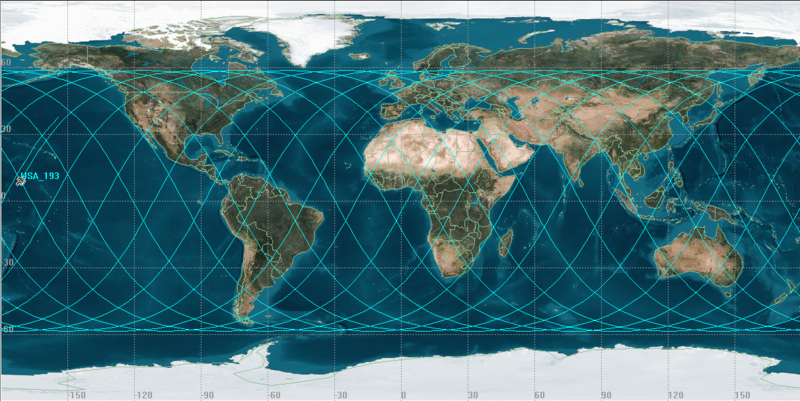 I suspect the reentry path would be fairly predictable up to the last few orbits where most of the breakup would occur. At that point I’m not too sure how accurate any predication would be especially as to the fuel tank with over 1000 lbs of propellant. The experts here seem to think the fuel tank stood a decent chance of surviving re-entry and would have released its contents on striking earth. It's a paper on the status of Aegis/SM-3 and where it's going. Very interesting reading. > If, and we still don’t know, the United States was able to modify a Standard 3 system to successfully strike a low orbiting satellite it was a tremendous technical achievement. - Nothing special, - this all was predictable from the initial SM-3 capabilities (interceptor speed, possibilities of precision control etc.). Even considering the fact that special improvements to SM-3 was made in a sum of 35 - 40 mln., - just for this intercept - the platform itself was very 'able' from the very first days of creation. I do think that all this looks like rather as 'SM-3' mod, not the 'brand new' dedicated system. Thoughtful read indeed. I will continue to follow Admiral Hicks’ work with interest. Thanks for the share! Based on the USA 193 satellite intercept, I think a modified GBI system launch would have the ability to strike satellites in medium or high orbit given the right set of environmental circumstances. In that situation, I see no technical reason why the ASAT-GBI would have to be limited to a silo-launch and could, in fact, be mobile. I disagree on your conclusions as to the difficulty of this launch. To modify the Kinetic Kill Vehicle (KKV) to strike the satellite alone was an exceptional technical achievement. > I disagree on your conclusions as to the difficulty of this launch. To modify the Kinetic Kill Vehicle (KKV) to strike the satellite alone was an exceptional technical achievement. - Practically, it may be only reprogramming of sensors and data acquisition / processing systems. In the worst case, - changing the sensors + reprogramming again. For the first time in its history, a B-2 has crashed. The mishap happened today as the bomber was attempting to take off from Anderson Air Force Base on Guam. Both pilots ejected safely. The total US inventory of these aircraft now falls to twenty. It's very interesting fact that Soviet Union/Russia never had technical ability to destroy orbital satellite with missile. Technically speaking, we can only say that the Soviet Union or Russia have not demonstrated this kind of capability. The basic capability to hit satellites was demonstrated in a number of test of the IS system. The Soviet Union also had a few direct-accent ASAT projects. P.S. I'm seriously thinking about banning users with names like "Russian", "Ukrainian" or "European" or "American". Your actual (first) name would work much better. > I'm seriously thinking about banning users with names like "Russian", "Ukrainian" or "European" or "American". - Of course, you can do it at any time, as a blog owner. - In short: more unical content, - more visitors; more visitors means more popularity of your site / blog. You probably meant "unique". I certainly value the input provided by the readers. But I would rather not see people using comments to pretend that they speak for all (or 70%) of Russians (or anyone else, for that matter) leave alone to make disparaging remarks about other users. Similarly, I would rather not see users making all kind of erroneous statements (about SS-24 missiles, for example), which are then attributed to this site by journalists. > You probably meant "unique". - Yes I meant 'unique content'. - Pavel, I am sorry, - but you're completely 'out of the ground' in this question. Come to Moscow and ask first 100 people you meet about their attitude to the modern NATO and US military programs... Ask them about Russian military programs, - you'll be surprised by their REAL attitude you're trying to hide here at your blog. - As to 70 % of Russians, - it's the data of sociologists that is completely correllate with my own life experience. Again, it's just my opinion, - and just a private comment. Or we MUST HAVE NO our own opinions here at your blog? > ...to make disparaging remarks about other users. - If you want to maintain a proper style of discussion here, - the first thing you need to discard, - it's 'double standards'. > Similarly, I would rather not see users making all kind of erroneous statements (about SS-24 missiles, for example), which are then attributed to this site by journalists. - Pavel, relax please. If journalists do not wish to see the difference between BLOG OWNER opinion and other person's private comments on the blog, - this is not 'journalists'. It's defamators. Like it or not it IS Pavel's blog. As it is respected and often cited as a reference it's understandible that he'd want to maintain certain standards. And thinking MSM journalists who might come here would take the time to decipher who said what about a particular subject. . .well, that's just crazy talk. I can only support Pavel's concern about "Russian", "Ukrainian", "European" or "American". What does it matter to use a "real" name or a unique pseudonym? Moreover I agree with Scott Ferrin - just imagine what sort of transparency and professional collection of facts about Russian and (thanks to Frank Shuler) US Arsenal we would missing without such websites! And moreover I think we all should be gratefull to have an open russian forum where we can discuss things which could bring blog owners right into the Lubyanka some 20 years ago! And it is this degree of freedom that even tolerates guys who thinks that they are representing 70% of people's opinion. In short: to honour Pavel's work for the public I think it's only fair to accept his requests! And it is 100% dead! - Gentlemens, - first of all, - we must be honest: russianforces.org is NOT a 'Russian' forum, - it's American one.